The most significant map of Long Island in the 19th century. Map of Long Island, with the Environs of New-York and the Southern Part of Connecticut, compiled from Various Surveys and Documents. A fine first edition example of John Calvin Smith and J. H. Colton's 1836 map of Long Island – one of Colton's first published maps. 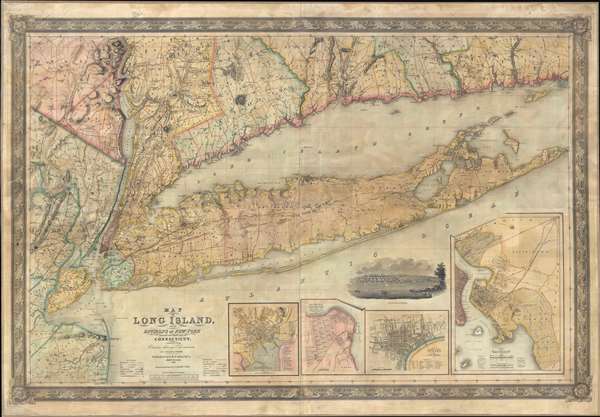 This is the largest, most significant, and most beautiful map of Long Island to be issued in the 19th century. Covering all of Long Island, the map also includes the Long Island Sound, New York City, and parts of the New Jersey and Connecticut coastline. Inset maps detail Brooklyn, Newark, New Haven, New Brighton and Tompkinsville. The earliest and best wall map of Long Island in the 19th century. The title described this map as being 'compiled from various surveys and documents.' By this, Smith is most likely referring to unpublished maps prepared by the United States Coast Survey. Although the U.S.C.S. had not yet published any significant material on the region, they had been active in the New York City / Long Island area since their 1807 founding. Whatever Smith's sources, the quality and accuracy of his map surpasses all previous mapping of Long Island and, for the first time, present the island from a sophisticated cartographic perspective. As such, it served as the template for most subsequent maps of Long Island, including the 1842 William Mather Geological Map of Long Island, the 1873 Beers Map of Long Island, and most likely even the 1890 G. W. and C. B. Colton map of Long Island. It would also, it some later variant, have no doubt been used in the planning the construction of the Long Island Railroad following the American Civil War. The publication date of this map is itself quite interesting. 1836 was an important year for both Colton and Stiles for it was then that J. H. Colton, who had previously worked as the 'Co' in 'Stiles and Co.' branched out on his own to found J. H. Colton Co. As such this map, along with the Topographical map of the city and county of New-York, constitute the first publications under Colton's imprint. Colton, a savvy businessman, would go on to become one of America's largest and most influential map publishers. This map is a true rarity. The platemark all around give evidence to early copper or steel plate engraved, predating the lithographic revolution in the 1840s. The map was drawn by John Calvin Smith and engraved by Samuel Stiles. Published by J. H. Colton in 1836. There are known later editions issued in 1844, 1847, and 1854. Some later examples are lithograph. Very good. Full professional restoration. Backed on linen. OCLC: 46797081. New York Public Library, Map Division, b15025252.